Firefighters on San Francisco’s Treasure Island, after confirming the presence of black mold and other hazardous conditions at their former fire station last year, are perhaps among the happiest to hear that Mayor Ed Lee today proposed $47.3 million in funding over the next two years to bolster emergency services. The funds will go toward infrastructure upgrades and staff increases at both the San Francisco Fire Department and the city’s Department of Emergency Management, according to the mayor’s office. 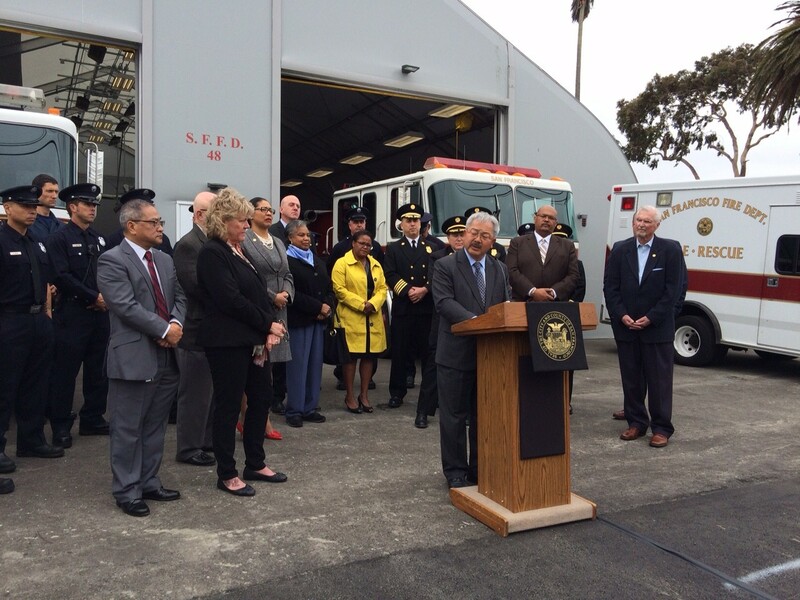 Lee, along with Board of Supervisors president London Breed and members of the San Francisco Fire Commission and the San Francisco Fire Department, made the funding announcement at the new temporary fire station No. 48 on Treasure Island this morning, surrounded by seagulls, palm trees, and overcast weather. The funds will not only be used to hire emergency medical technicians, paramedics, firefighters, and 911 dispatchers, but will also go toward hiring emergency management staff, purchasing new ambulances and fire trucks, and will be invested in new technology and facilities upgrades, according to Lee. The $2.7 million Treasure Island fire station, which is approved to be a temporary structure in operation for at least 10 years, has two structures, one constructed of metal beams and plastic fabric, and the other a traditional prefabricated building, according to Rommel Taylor, a project manager with the city’s Department of Public Works. The new structures on Treasure Island were long overdue, said station No. 48 Captain Mike DeLane. DeLane, who retires from his position of station captain in just a few weeks, said the temporary structure was desperately needed since the old one, constructed by the military in 1943, had black mold and firefighters were suffering headaches and sniffles and reported that the building was leaking. “I was concerned about people possibly getting cancer,” he said, adding that two people in the fire station did get cancer, but so far their illnesses have not been directly linked to the black mold they were exposed to at the station. DeLane said last year he was so worried about the conditions of the station that he used $1,000 of his own money and hired someone to inspect the building. And sure enough, black mold was found in locations around the building, DeLane said. The old station had water intrusion and was in no shape for firefighters to be living in, DeLane said. DeLane said he spoke at Fire Commission meetings and the fire department eventually conducted its own tests on the building, also finding black mold. She said as soon as the department discovered the unsafe levels of mold, the firefighters were moved to a training center on the island for about a year. The new station will be operational on Wednesday, she said. DeLane, however, said he and members of the station have filed a tort complaint against the city. “I’ve got 17 years of records showing they knew and they didn’t do anything,” DeLane said today. Hayes-White said that when the fire department first started using the old station in 1998, tests were run, but that conditions worsened over the years. The mayor said today that it was evident that the station was a “substandard station” and that when Treasure Island is eventually redeveloped, there needs to be emergency and medical services accessible to residents and businesses. Lee said it is of utmost importance to have emergency crews living in safe conditions so that they can focus on keeping residents safe. Lee’s proposed two-year budget includes $35.7 million in new fire department investments, including dozens of new EMTs and paramedics as well as 82 new firefighters, according to the mayor’s office. According to Tom O’Connor, president of the San Francisco Firefighters Union Local 798, the fire department is definitely hiring and many vacancies remain unfilled. The proposed budget will fund ambulances, fire engines and fire trucks, as well as infrastructure improvements at fire stations and public safety radios for the fire, police and sheriff’s departments, according to the mayor’s office. The mayor also announced a Mobile Integrated Healthcare Practice team that will help reduce 911 calls and emergency room use by working directly with frequent callers. Lee is also proposing $11.6 million in new Department of Emergency Management investments, including three 911 emergency dispatcher classes over the next two years, along with funding for overtime pay for new hires being trained to address increasing 911 call volumes.